Picked up 5 bogeys today, but I buggered up at least 2 or 3 par chances with 3 putts. Holy #@*+ shad leaves Q for someone else. CBC has a backbone?! I can't recognise my brother's wife on the street for the life of me. A few times I walked right by even after she said hi (without name). I'm taking my first day off of the year tomorrow. Hurray! Dodged a bullet with my brother's online wedding photo album. Signs of summer - you start going through half a pack or more a day. The "new" Black Panthers? Is history repeating itself again? Even protest movements are as derivative as the 6th Transformers. Did some sports program just ask whether Cam Newton is the best in the NFL? Did people forget about the Super Bowl?! 4 day sobriety! I'm punching my passport to Mormon or Muslim heaven! I thought that these events were meant to have dress standards?? It's not the Ascot. 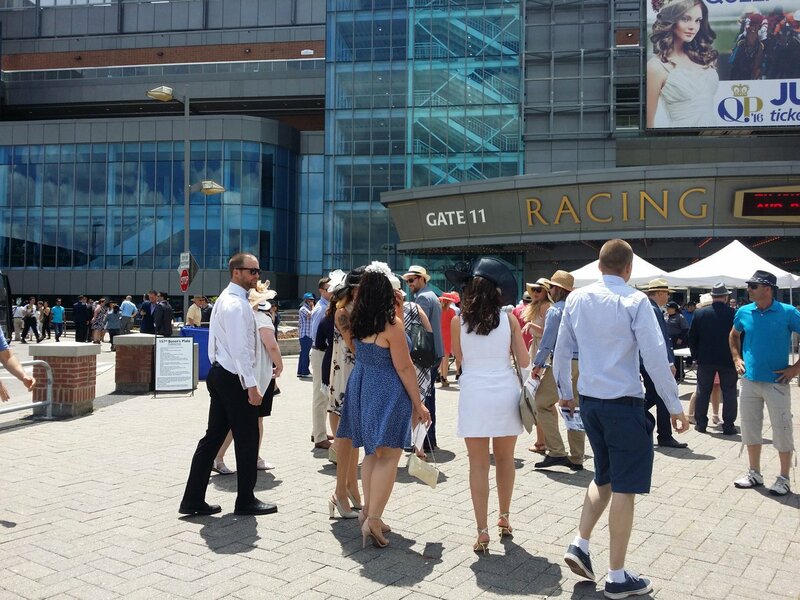 The race is quite prestigious and largest purse in Canada. The last time I saw morning dress was 2010 when the Queen came with Prince Philip. It was 35c+ or something so I'm not sure that was prudent. Then it went into a slump so the past few years they have been playing up the social media bit, and young & fashionable crowd. Lots of adverts about the Hats and Horseshoe party. Bombay street food here I come. The day of the Royal Ascot! Wedding rehearsal day. What shall I rehearse as an usher? Big presentation tomorrow for work. Have to convince VIP to OK spending 1.2M on my proposal. Then I have the usual Wednesday night speech. Hope that it went well, Fwiff. Not quite. What I thought was a straight line from A to B is jagged, filled with potholes and possibly requires a bit of retracement. But hey, that's what makes professional life interesting. Got nominated top 3 for outstanding speech in my class of 21. Didn't win. Embarrassing. Really out of practice putting on black tie. But worth it for Carmen! Queen Elizabeth turns 90 today - for all but a few of us, we've known no other on the throne. I just noticed my new boss likes to rap his knuckles on tables and walls like House of Card's Frank Underwood. Back to Atlanta I go. Another two or three week push. Working for the yanks today. No time for Easter egg hunts. Tchaikovsky Symphony No. 6. I remember my father used to listen to this after the really bad days at the office. What is a man when he is at work close to 2100 and he first stepped into work around 0800. Thank you whoever decided to pull the fire alarm last night in my flat. I was trying to catch up on sleep, but you really spoiled it. Why is it the local flower shop never sends me notification when things are delivered? Buy local rubbish. Conglomerates are better. Almost no reason to unpack my travel bag as I'm back on the road again on Monday. Listening to Chopin. Prelude Op. 28, No. 4. Defeat is an orphan and victory has a thousand fathers. Relationships with women: Funny they work just when my credit card starts to work. I almost left my flat today with a brown suit, brown shoes and black gloves. Luckily I went back and changed the gloves. Phew - that was lucky! I hope that your wallet and belt were also brown. Belt yes. Wallet - I have a stainless steel money clip and a card wallet with black/brown tones. Lays advert: Mr. Potato Heads eating potato crisps. Isn't that cannibalism? People trust you with kids? I would be checking sippy cups for booze all night. She was telling me about her trip and which people couldn't handle their alcohol and what the telltale signs are. Christmas Eve in the office! Time to break out the whisky?